Wolves midfielder Jordan Graham says his loan stint at League Two Oxford United was a vital step towards making his full debut for the Molineux club. Graham, 20, returned to Wolves at the end of October after a month with the U's and was named in the starting line-up for Saturday's draw at Ipswich. 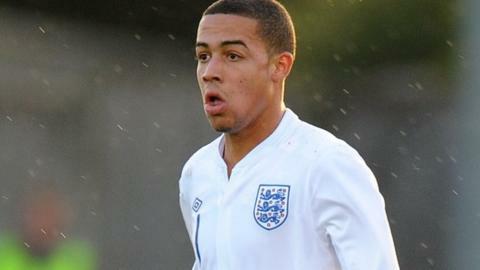 "It was a great loan for me because I feel I really improved and matured," he told BBC WM 95.6. "I can tell I've got better, especially off the ball, I'm really pleased." Graham is a former England under-17 international and came through the youth system at Aston Villa. While at Villa, he had loan spells with Ipswich and Bradford City before joining Wolves in January, following an initial loan. He is now hoping to emulate house-mate Kortney Hause, who established himself in the first team after returning from loan at Gillingham. Jordan Graham is hoping to emulate Kortney Hause (Gillingham), Dominic Iorfa (Shrewsbury) and Jack Price (Yeovil & Leyton Orient) and use a loan spell as a springboard to a regular starting spot at Molineux. "He went to Gillingham, came back and started playing," Graham said. "He said 'go out to Oxford, do your stuff and you'll get your chance'. "I didn't play against Birmingham or Bristol City, but I knew I just had to carry on training hard and somewhere down the line I'd get a chance - I was always prepared." And after impressing in the 2-2 draw at Ipswich, which followed five appearances for Oxford, Graham is hungry for more action. "Yeah, 100 per cent," he added. "It was amazing and I just have to take it in my stride. I know I can give more. There's always room for improvement and let's see where I can go."